Administrators are now able to turn approved Workflows on or off from Administration > Workflows using a toggle switch. If a Workflow is still pending approval, the toggle switch will be disabled with a question mark icon that provides details on the review process. A shortcut has been added to the Workflow page, allowing Administrators to edit email templates associated with a Workflow. To get to the Workflows page, navigate to Administration > Workflows. Click the plus sign to the right of a Workflow to show more details. Next to each email templates is an edit pencil, allowing admins to edit the template right from there. Account Owners will now see additional prompts when decreasing user licenses on their account. 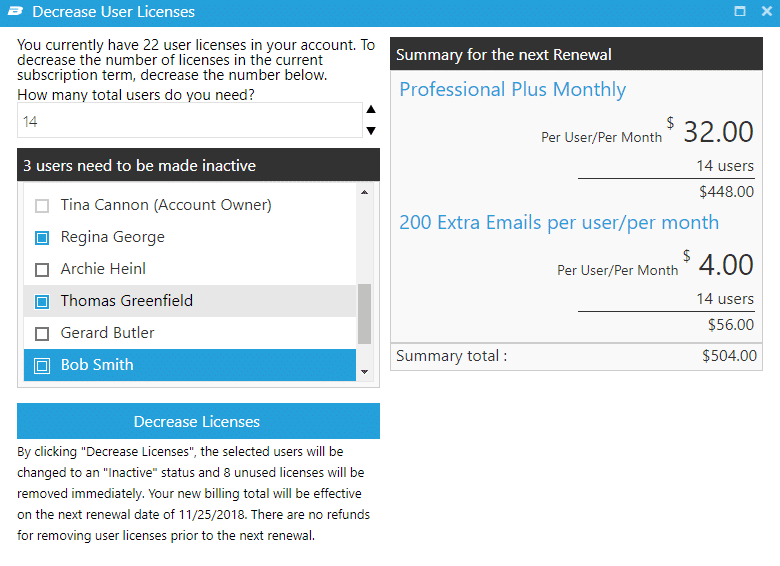 To access this page, navigate to Administration > Subscription, then choose “Decrease User Licenses.” Note that the options that display on the Subscription page vary depending on the account’s package. For example, if you have a no renewal package, user license count cannot be adjusted. Based on the number of user licenses that are being removed from the account, and the number of usernames that are currently active, there may be a prompt to choose a user(s) to make inactive when the update is made. Account Owners cannot be removed. Several updates have been made to the Manage Users page. To navigate to this page, go to Administration > Users. If there are licenses that are not currently being used, you will be prompted upon entering the page. A shortcut has been added to increase or decrease licenses, saving the extra clicks to navigate to the Subscription page. To add or remove licences from the Manage Users page, Account Owners can click the up/down arrows next to Total User Licenses. Depending on the arrow clicked, a dialogue box will open to either increase or decrease the total user licenses available on your account. If all user licenses are being used and the “Add New User” button is clicked, a prompt will appear with two options to proceed. You can either make a user inactive to free up a license for the new user, or click the link to purchase an additional license. You will also see this prompt if you attempt to make an inactive user active when you have already reached the max licenses.